A couple of weeks ago, I posted on one result of the U of M Extension Service’s MAP work, the “Top Ten Reasons to Make It a Weekend in Northfield“. I hinted that there was more to come. The so-called “Doughnut Group” had another meeting, this time over muffins. Hayes Scriven of the Historical Society, Rob Schanilec of By All Means and I met to follow up on some ideas we had raised about a month ago. 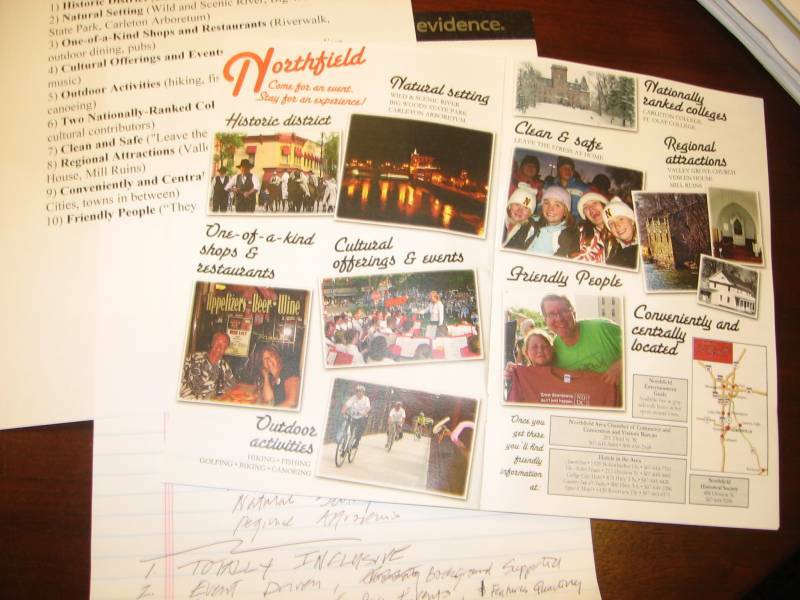 Essentially, we want to present the “essence” of Northfield to potential visitors through focusing on appealing events and featured assets, while using the community background information as supporting material. Our goal is to produce this Northfield guide on a quarterly basis in order to keep it fresh. Sitting on my desk is a quick mock-up by the talented Mr. Schanilec. Hayes and I were very enthusiastic, offered a few suggestions to Rob, and now we’re going to develop the model a bit more before taking it on the road. Hayes had shared our concept with the CVB. Apparently, they’re interested. Perhaps a collaboration with that group will take the idea even further into the regional market.